Sorry I was away so long. I was in Spain, and then China. Let me tell you about the China trip. One of the first things I discovered on the China trip was that I couldn’t write posts on Our Finite World from China, thanks to China’s censorship. I could, however, read posts that I had previously written on Our Finite World. The impression I got was that China allows a moderately free expression of opinion, as long as it is through a recognized organization, like a newspaper, or even The Oil Drum, or Energy Bulletin. What they don’t seem to encourage is sites by individuals. Sites that were unavailable included Facebook, any Blogspot blog, You Tube videos, and any site on sites.google.com (including the new Biophysical Economics site). Given the number of sites that seemed to be unavailable, I was glad that ourfiniteworld.com was at least readable from China, even if I couldn’t add new posts. It may be the fact that Our Finite World doesn’t use “wordpress” in the URL that permits it to be read. (I have to access a WordPress page to update it though.) English language newspapers in China seemed to carry a range of stories, including ones about expected power shortages this summer, and about recent college grads not being able to find jobs. 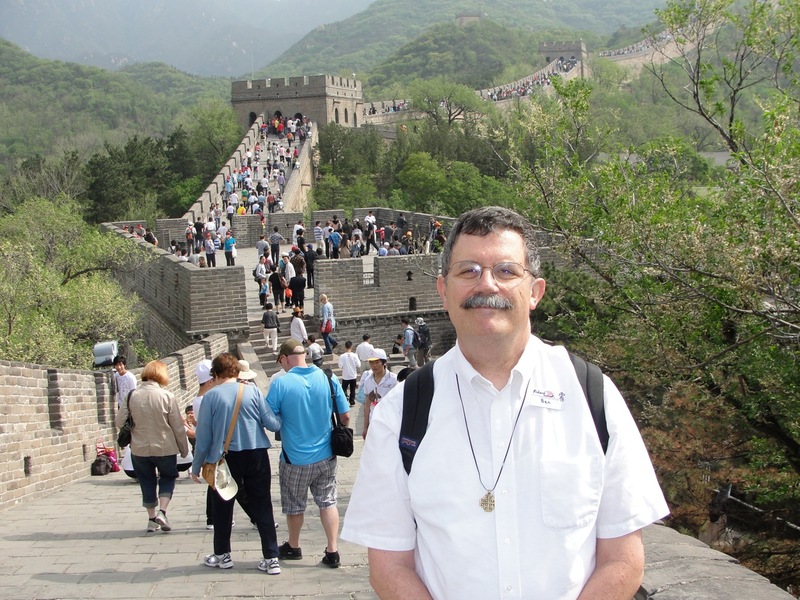 My trip consisted of two parts: (1) A visit to China University of Petroleum for three days, followed by (2) A commercial to tour (by Viking) which included stops at Beijing, Xian, and Shanghai and a boat ride down the Yangtze River from Chongqing to Wuhan. 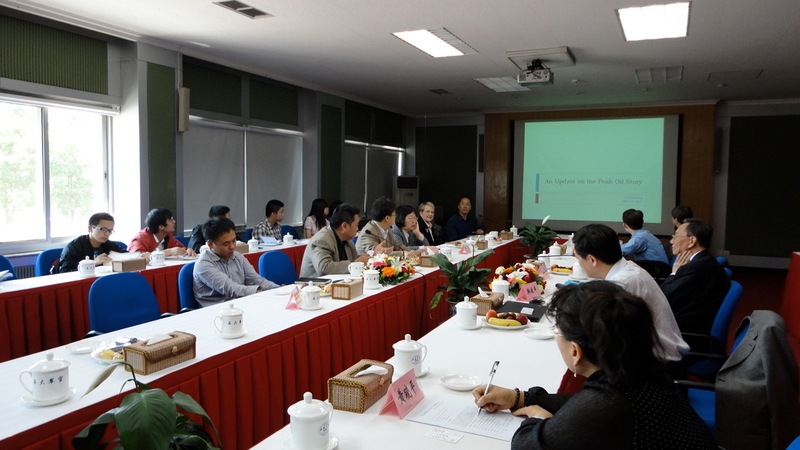 Professor Feng Lianyong invited me to visit China University of Petroleum, to meet with his students and to speak at a small symposium he was putting on that included a number of local dignitaries, plus people from Petroleum University. Professor Feng’s students are working on a variety of Biophysical Economics type research projects, with a special emphasis on China’s issues, such as how fast Chinese natural gas production can reasonably be ramped up. Their group makes up ASPO-China. Professor Feng spoke at the Biophysical Economics conference in Syracuse, New York in October, 2009. 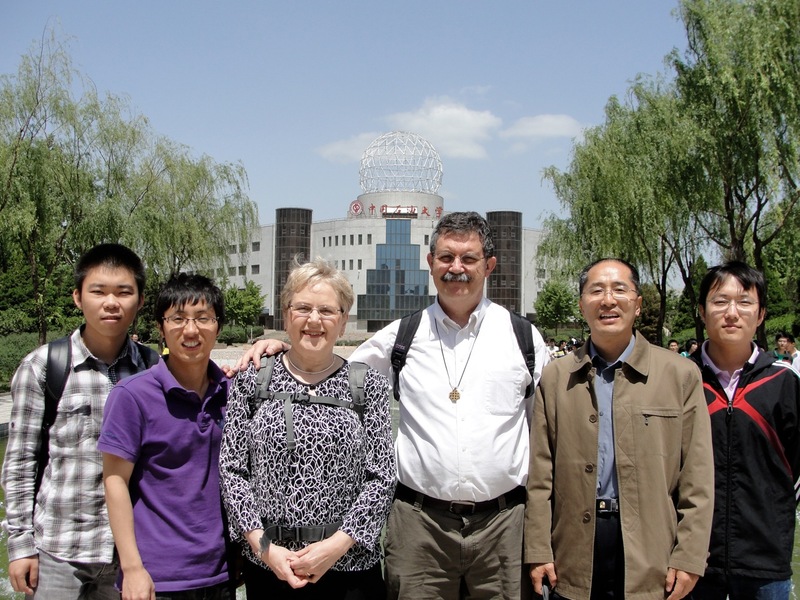 Gail, her husband Ben Setzer, Professor Feng, and three of his students at the University. 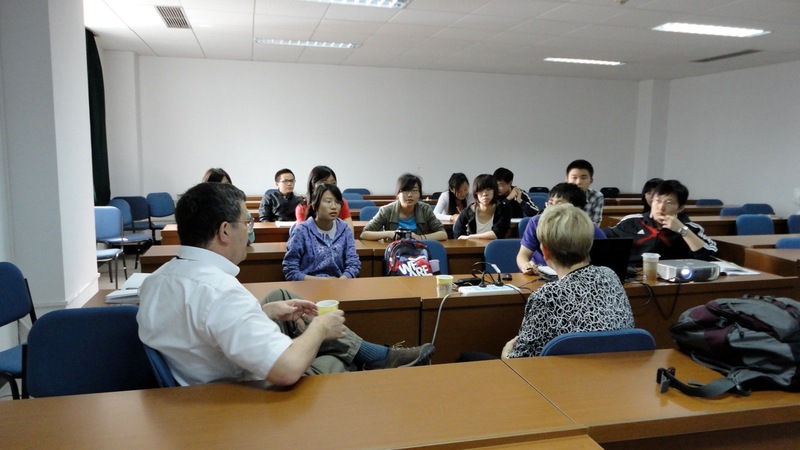 We met with Professor Feng’s students, and they told me about their projects. I was impressed with their diligence. There are not many places with as many students working on peak oil and EROEI-related projects. They told me that Michael Hook from Uppsala had visited their university earlier. One morning, I participated in a symposium with a number of Chinese leaders from the area. This is a copy of my talk. The various Chinese leaders spoke in response to what I had to say. I was struck by how much they sounded like US leaders. To them, peak oil was not a major concern, although one of them did agree that some of what I was saying seemed to make sense. One thought that natural gas would save the day. Climate change seemed to be a bigger concern than peak oil. At least one of them seemed to think that by raising interest rates, they could solve the problem of rising food and energy prices. It occurred to me that the United States tried the higher-interest rate approach back in the 2004-2006 period, and those higher rates contributed to the 2006 and subsequent crash in home prices, but I didn’t think to mention it at the time. The representative from an electric utility was concerned because coal prices are rising, but the Chinese government is not allowing electricity prices to rise by a corresponding amount. Of course, if electricity prices are allowed to rise, China will find that the discretionary income of a lot of people is being squeezed. As the latter part of this post shows, Chinese citizens now have many loans outstanding on condominiums. If citizens find their incomes squeezed by rising interest rates, and by rising food, oil and coal prices, China could see loan defaults similar to what other countries saw in the 2008-2009 recession. I saw a lot of interesting things around China. Of course, I saw the usual tourist things, like the Great Wall of China. 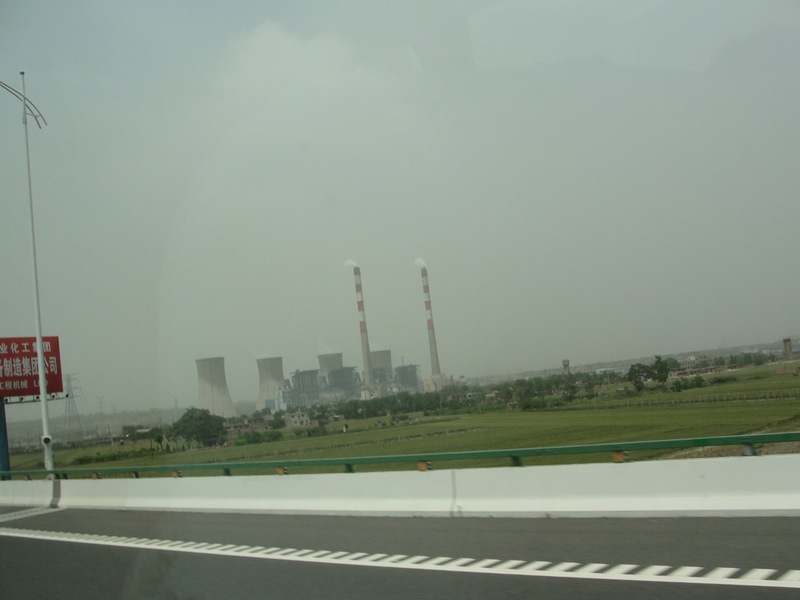 I noticed many coal-fired power plants, often right within cities. As a result the air seemed to be very gray in many cities. This installation had four cooling towers. The number of new high-rise buildings is just amazing. This photo is of one group that was being put up. The wider brown area on buildings is bamboo scaffolding during construction. HIgh rise buildings under construction in Xian. We were told the national bird is the (construction) crane. 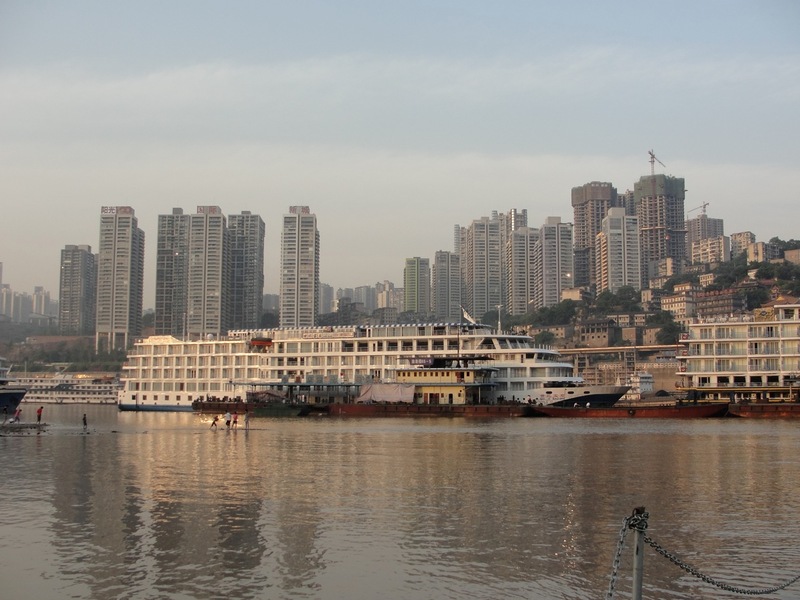 This is a picture of a few of the buildings in Chongqing and our boat. Old housing is being demolished and people are being encouraged to move to new high-rise buildings. The “selling point” is that the new apartments are up to three times as large as the old living spaces, and that they have their own bathrooms (often two) so people don’t have to wait in line for communal bathrooms down the street. In the new apartments, people can also install air conditioners. We were told that people buy condominiums without flooring, windows, and other furnishings, then get a mortgage to cover the cost of the apartment plus the cost of improvements (or perhaps it is two separate loans, but we were told the loans on the improvements were for 10 or 20 years). Even if the government makes a payment for the old home, most people will still need a loan to cover the cost of the improvements. I expect most will need a loan for the condominium as well. Many of the old style homes seemed to be provided by the government at no cost, so for many people, this is their first experience with a loan of this type. Condominiums in Beijing and Shanghai are very expensive; condos in other cities are less expensive, but incomes are lower as well. 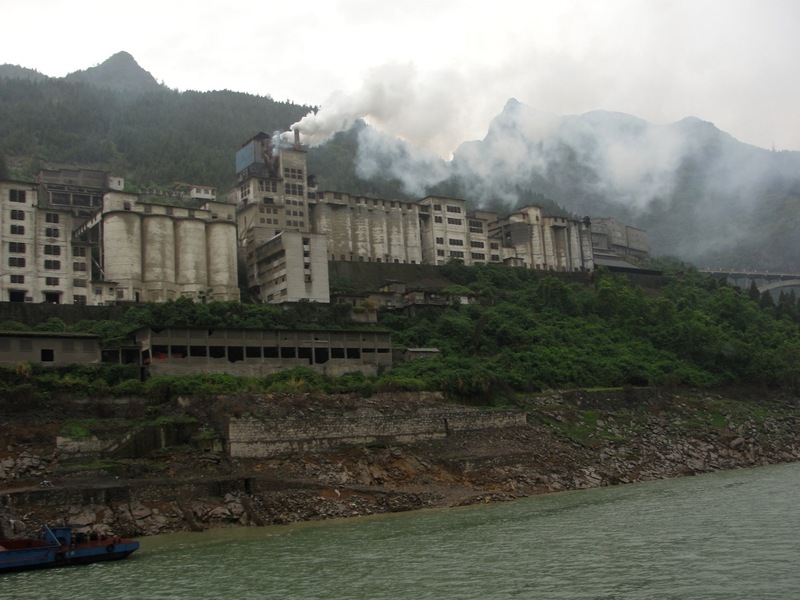 The area that was flooded by the new higher water level was good flat farm land along the Yangtze River, created when the river flooded in the past. We were told that farmers were encouraged to carry the good top-soil up the hills to new locations, but it is hard to see that there would be very good farming locations in such a hilly place. Some of the other businesses were lost as well when the area was flooded. Now, many people have lost their former types of employment, and are trying to make a living from tourism. Building an economy on tourism doesn’t look like a formula for long-term success, especially if oil and coal are in shorter supply in the future. The characters that cannot be seen in the picture above were covered by a land slide. Landslides are fairly common on the steep limestone hills along the Yangtze. A person would hope that the landslides do not affect new high-rise apartment buildings. 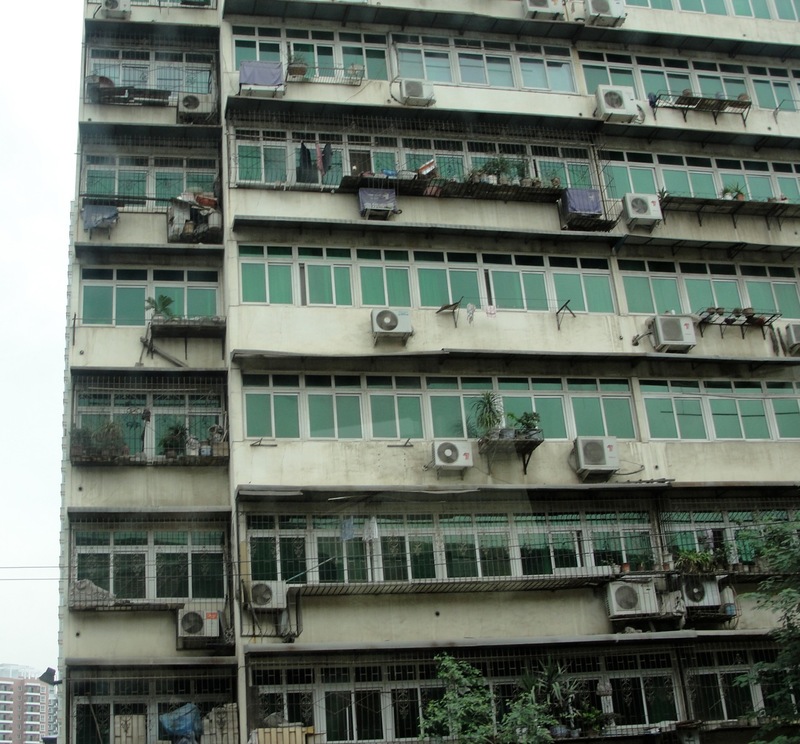 With a massive amount of new building, and new air conditioners everywhere, it is easy to believe that China will be running into electricity capacity constraints. English language Chinese newspapers are talking about electricity shortages this summer. According to Chinese papers, residential use is supposed to be given priority, if there is not enough electricity to go around. It is easy to see that there might not be enough electricity for commercial and industrial use, with the amount of new residential use that is being put into place. Furthermore, if coal prices are rising, and the government is not allowing electricity prices to rise, electricity supply may also be constrained by cutbacks in production by electric utilities that cannot make profits. The agriculture we saw did not appear to use fossil fuel for cultivation. 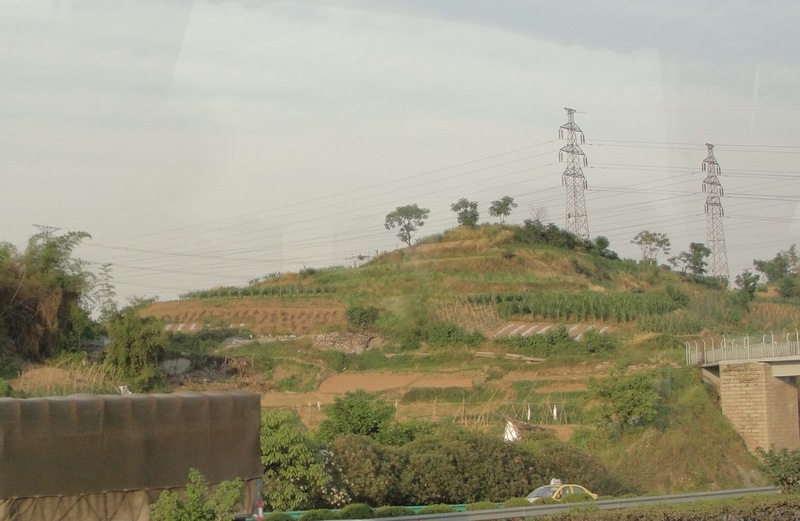 We saw many farms terraced on hill sides. It appeared that only human labor was used in tilling these farms. We also saw goats in one area. It didn’t look as though the area was good for many other types of agriculture. Goats grazing on hill side. On flat areas, we saw water buffalo being used to till the soil. 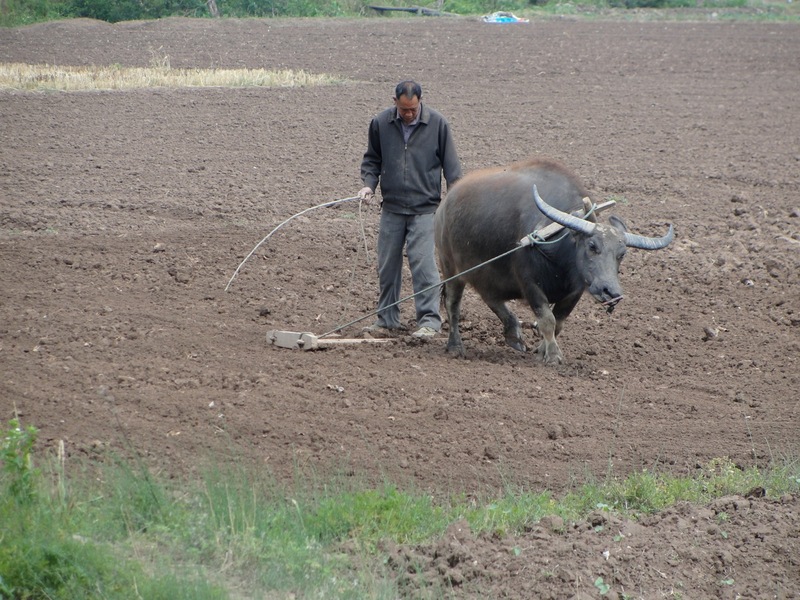 Man plowing with water buffalo. I have no way of knowing whether more fossil fuels were being used for cultivation elsewhere. It looked to us as though fossil fuels were mostly being used for industry. This is one plant we saw along the Yangtze. I am not sure what it does, but it does seem to have emissions. We were astounded by the progress that China is making in raising the standard of living of at least some of the Chinese. 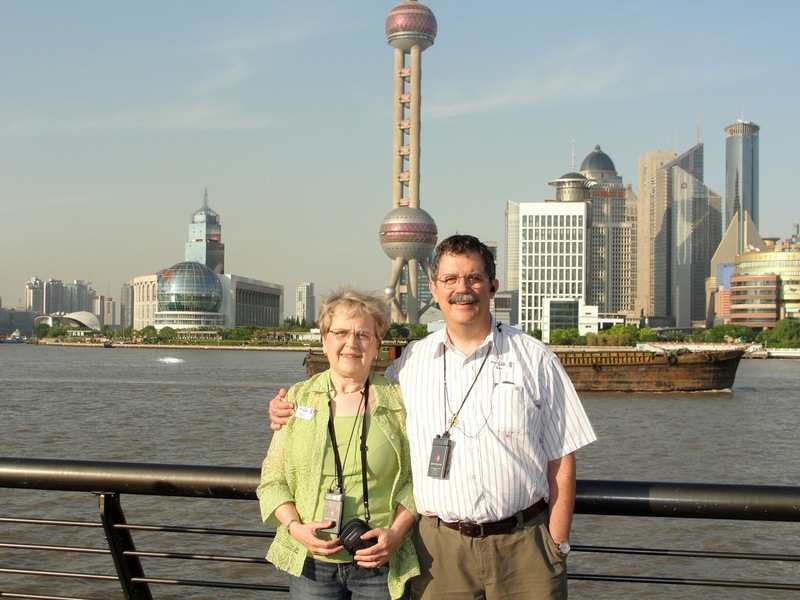 This is a picture of my husband and me in the “Bund” area of Shanghai. The catch seems to be that much of this progress is being financed by loans. As long as growth speeds along, and the employment level is high and condominium values continue to rise, borrowers will have a reasonable chance of paying back their loans with interest. The problem with these loans in China is the same as the problem in the rest of the world–it is hard to maintain the high level of growth needed to keep the whole system working, that is, enough people employed, and the values of the condominiums growing. It seems likely that some people will have trouble paying back their loans if the economy stumbles at all. The problem is that as the government tries to cool the economy with higher interest rates, or as electricity prices naturally rise with higher coal prices, people will find their incomes squeezed. The “consumer” economy in China is not nearly as large as in the US, but it will still have an impact on the Chinese economy. Also, the rest of the world is approaching a point where it is hitting government debt limits. So demand from the rest of the world may very well begin to decline in the next few months. There are also special regional issues, including the current drought in parts of China, and the areas where jobs were lost along the Yangtze, west of Three Gorges Dam, including new Qutang. These areas are likely to have more problems with loan defaults than other areas. 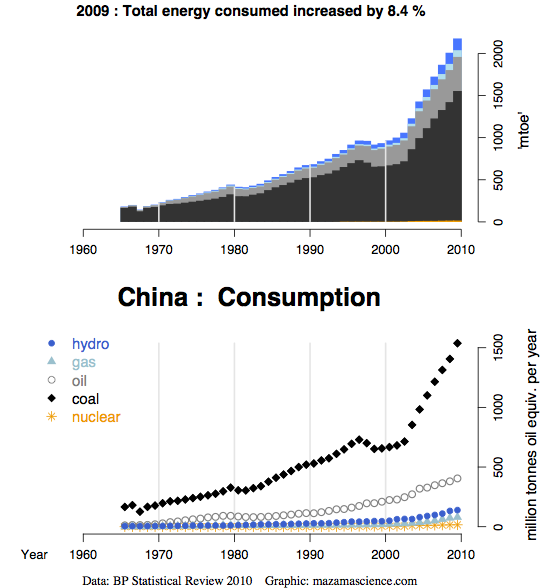 China, like everywhere else, depends on fossil fuels for most of its growth. China has been different from the rest of the world, in building its growth on coal use, rather than oil use. China’s weak point would seem to be rising coal prices, because rising coal prices tend to raise electricity prices and home heating prices. Rising oil prices can also be expected to have an impact. China imports a lot of food (sorry I don’t have a percentage–our tour guide said 50%, but that would be hard to believe), and imported food prices tend to rise with oil prices. The weak point in other economies is the financial system–the ability to pay back debt with interest when fossil fuel prices rise. The fact that governments raise interest rates to choke back increases in fossil fuel prices tends to make this problem worse, and China is following the higher-interest rate route. I don’t know how well the Chinese government will be able to deal with debt default issues and falling condominium prices. China seems to have power to change laws more quickly and in different ways than OECD countries do, so once the debt-default problem starts, China may be able to disguise the problem for quite some time. But to the extent that China has changed itself to a capitalist system, it seems like China will have the same debt-default issues as everyone else, as the economy slows. The next few months will be interesting (??) to watch. Governments of OECD countries are facing debt limits. As governments cut back on spending in response to these limits, the West is likely to re-enter recession. This time, recession may affect China to a much greater extent than in the past, because of the greater role household debt plays now, and because coal and food prices are now higher. It will be interesting to see how all of these forces will work together. China remains an enigma, but perhaps these observations will give a little insight into how China fits into the world picture in the future. This entry was posted in Financial Implications, News Related Post and tagged China, coal. Bookmark the permalink. Yes Ernest, the city transport service in Shanghai and Hong Kong is marvelous. I was in Hong Kong for 30 days this time and traveled almost daily from Tsuen Wan West into Central for various appointments. Trains came through about 2 minutes apart during peak hours, but maybe 4 minutes apart at other times. I obtained a MTR system map so that I could easily change trains for other destinations. You can punch in the details and purchase a ticket for any destination, but I chose to put $100 Hong Kong dollars on an Octopus card each week, as I was traveling so frequently. That probably means it cost me about $25US each week. Even on a crowded train if I wanted a seat any younger person would give this 71 year old woman their seat if I looked their way. Peak Oil, Climate Change, Electricity Shortages are all interlinked with positive enforced feedback loops. As you said, the near future will be interesting. China is having increasing problems with its energy security. The levels of growth & development in china are amazing. But the levels of pollution are equally appalling. A true Faustian bargain. There may be 300 million middle class benefiting from the economic miracle, but the average yearly income in western China is around $1,000 (USD equivalent). I was told that students didn’t want to accept jobs in Western China, even when offered jobs there at reasonable salaries, because conditions are much less good than in Eastern China. Even where i visited, you could tell that there was a wide range of income levels. We saw a lot of street vendors and fair number of beggars (often deformed). We were told that the unemployment rate is understated, because benefits are so limited (for new graduates, etc) that some don’t bother registering. 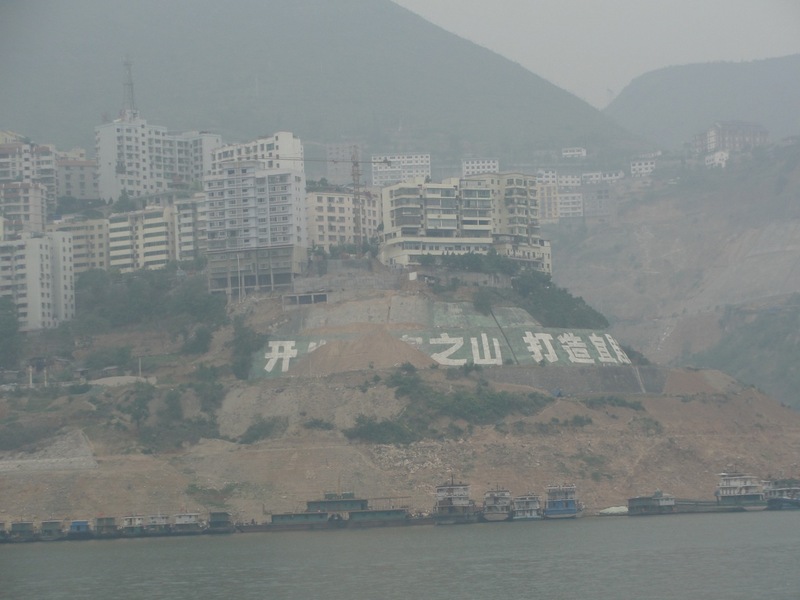 I visited a school in Jingzhou (between the Three Gorges Dam and Wuhan on the Yangtze). The 4th grade class room I saw had 48 students and one teacher. I was told that classes could have up to 70 students. My impression was that there were not enough text books to go around, but the children seemed to take it all in stride and share books or learn from the blackboard. Thanks for the post Gail. It seems as though China has decided to use debt slavery to motivate their population. Copy cats. They will be sorry. The big debate in Australia is a carbon tax. I do not know if it is for mining carbon or for burning it. The former, I hope. This tax will be blamed for all our economic ills. Regarding the Symposium, after the discussion, the “speakers” were served a very fancy lunch that included a little wine. So I guess in some sense it was a drinking party. The participants also received a small amount of financial compensation. As far as I know, all the discussion related to carbon taxes applies to local consumption. These carbon taxes have the effect of encouraging outsourcing to China and India, so we lose jobs and encourage more use of coal there. Everything I can see says that world CO2 production is not helped at all (and may be made worse). 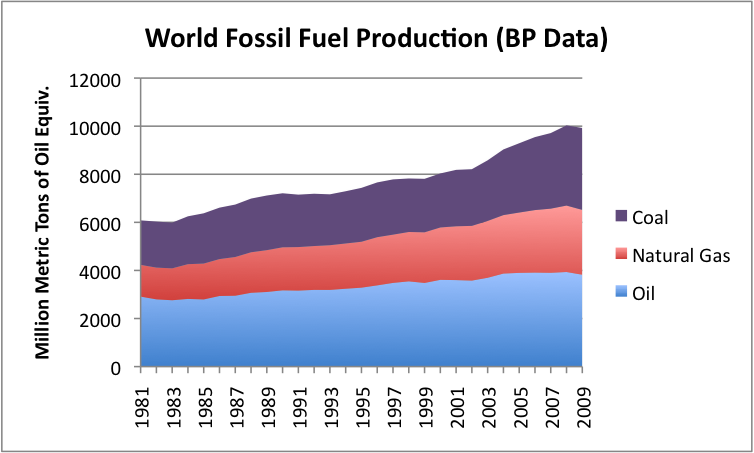 It seems to me that we are maxing out world oil, coal and natural gas consumption. World coal use has soared in the last ten years. I wonder how the world result could have been any worse, without the carbon taxes that have been in place. It seems to me that carbon taxes in OECD countries just allow/encourage more consumption in non-OECD countries. The fact the European cars are small, and they use more rapid transit, has simply allowed the rest of the world to use more fossil fuels. This is link to a graph I made earlier. If there is a positive effect of carbon taxes on consumption, it might be in something like tree planting. But I am not sure the world is making much progress on tree planting either. A Carbon Tax could do wonders, if properly implemented. Otherwise, it’s a dice roll, and one cannot know who loaded the dice. has a wealth of information. I can’t say I agree with all of it, but I am pretty sure that Komanoff, Rosenblum, Handley et al. don’t agree with me on everything, either. The only real problem with a Carbon Tax is the political jackassininity that rules these days. In my view, all a carbon tax does is reduce use of fossil fuels in one part of the world, and raise their use in the rest of the world. Carbon taxes make people feel virtuous, but as far as I can see, they do nothing at all for total world consumption. All of the shifting of production of goods to China in recent years has greatly increased China’s coal use. World emissions have been rising more since the Kyoto protocol than anyone would ever have expected prior to it. If we drive small cars in the US, it just makes more oil available for Chinese and Indians to drive (small) cars. The total amount of oil gets used, regardless. I suppose to be fair to the Chinese and Indians, we should reduce our fossil fuel use so they can have more, but we shouldn’t kid ourselves that this does anything for climate. I understand the US is now exporting coal to China. Without a better approach, we would be better off doing nothing, IMO. It would at least save all of the salaries and air fares of those involved in the current discussions. I was fascinated by your observation that Chinese “leaders” appear to be no more clued in on the Peak Oil problem than US leaders. Maybe it has to do with how “leaders” are made. Does leadership require a sort of “glossing over” on the fine points of how a civilization keeps going, because perhaps, the lower class techies are expected to one way or another, take care of those minor, detail oriented problems while the leaders do the big vision thing? Our tour leader kept repeating a comment made by the late Deng Xiaopeng regarding economic reform, “When we open the window, some flies will come in. But we need the fresh air, even if there are some flies.” (This Economist article mentions to the quote.) This seems to be what is used to gloss over economic problems. Another thing is that Chine leaders include many who have studied abroad, and who are reading world economic literature. Many of them see the US as a country that performed an economic miracle. They would like to emulate world economic thinking as much as possible, thinking it will lead them to the high standard of living that the US and Europe have. I think you did not tell us you were leaving because you knew we would break into your house! Fear of house break-ins is actually an issue with respect to putting notices up of being out of town on public web sites. There are three of us living here (my husband, my 32 year old son, and I). My son was at home, so the house was not empty, but nevertheless, I didn’t think it would be a good idea to put up a public notice. I kind of vaguely mentioned my absence in an earlier post, but looking back, it was pretty long ago and pretty vague. Usually I travel by myself, and my husband and son stay at home. When I was a teenager, my family went away from our rural Michigan home on a 1½-year trip. Before we left, my Dad went to the local school (one room, ≈ 20 students K→9) to ask kids who lived further from the school than we did to stop by and check the house. They did. Late that winter, a pheasant tried to fly through the living room. One kids parents came, cleaned the pheasant juice from the rug, replaced the broken window. The bill at the hardware store awaited our return. A bottle of Jack Daniels was appreciated by the parents who had fixed things up. But that was a long time ago, back when dinosaurs walked up and down Lake Shore Drive here in Chicago, where I now live. Our society is too advanced today, what with the Internet, cars, flash mobs and all. I have read recently that problems have developed with the Three Gorges with the project causing problems with the local weather. 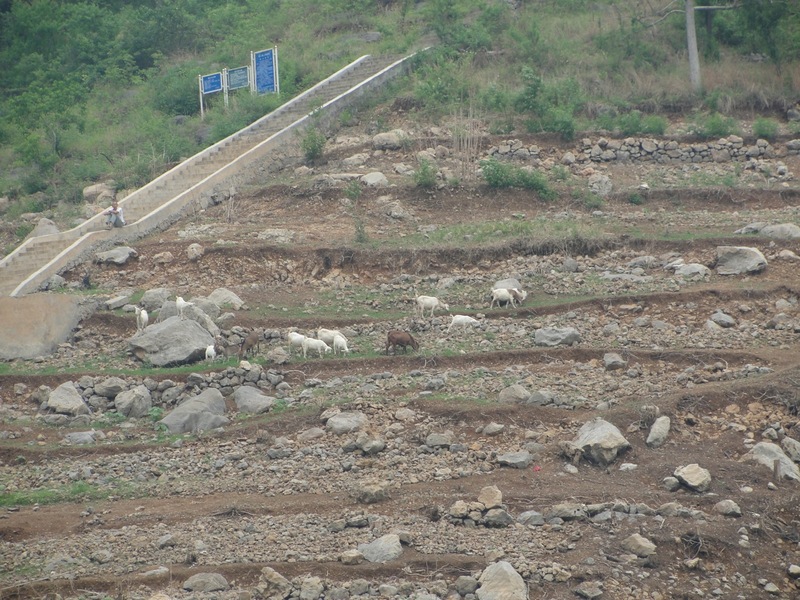 Could this be the reason behind the drought conditions in some places in southern China? I also read that the State Council is considering destroying the dam? Any info? I have a hard time believing that the Three Gorges Dam is causing problems with local weather, but I don’t really understand the situation. Apparently, the dam has caused changes in lake levels below the dam as well as in the river above the dam. It is the area below the dam that seems to have huge drought problems now, I believe (or maybe it is in both places). The lower lake levels below the dam are contributing to the problems, because the water is not available for irrigation. I suppose the lack of water in the lakes could also contribute to the lack of rain in the area. I have a hard time believing that they would seriously consider destroying the dam, especially at this stage of the game. It seems like they would spend quite some time and RMB trying to fix the problems first. What the problems might do is put an end to work on other projects that are not too far along in their construction. Maybe the problems will also encourage China to keep its one-child policy. With all of the country’s water problems, it is hard to support even the current population. Their Northern neighbor, Mongolia, has large coal deposits. The place is also a treasure trove of significant quantities of other minerals like copper, iron, gold, tin, lead, phosphates, molybdenum, fluorite, wolfram, oil, and uranium, with a tiny population for its’ size. A few people are going to make a lot of money there. Central planning can’t help their situation, either. 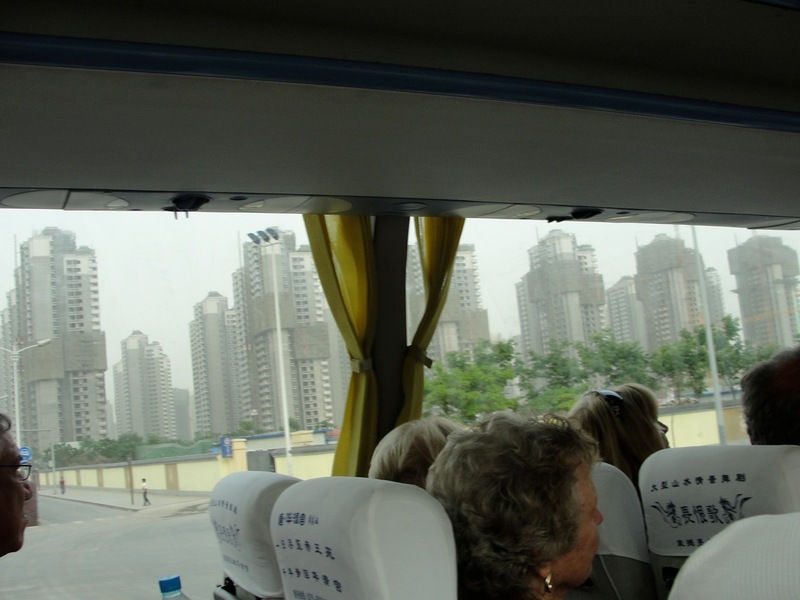 Free markets could have avoided problems like China’s Ghost (or Empty) Cities.